I have something really exciting news to share today! 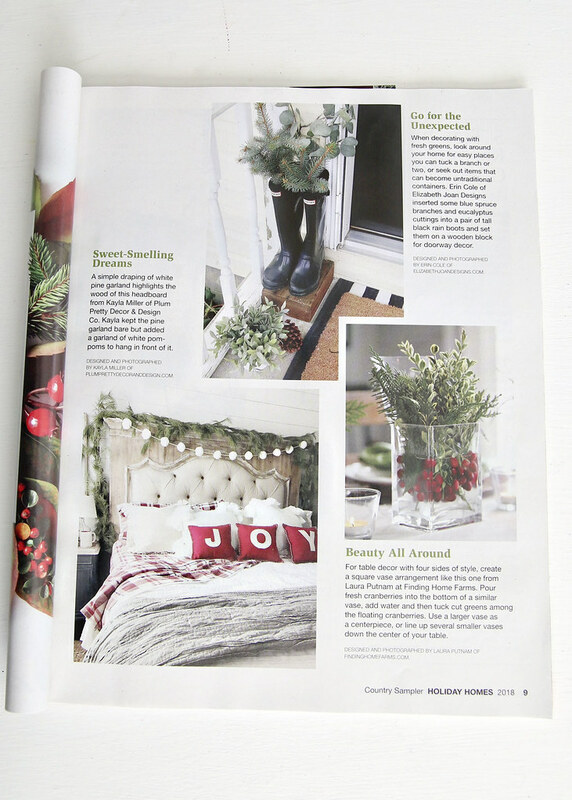 Elizabeth Joan Designs was featured in the most recent issue of Country Sampler Magazine! 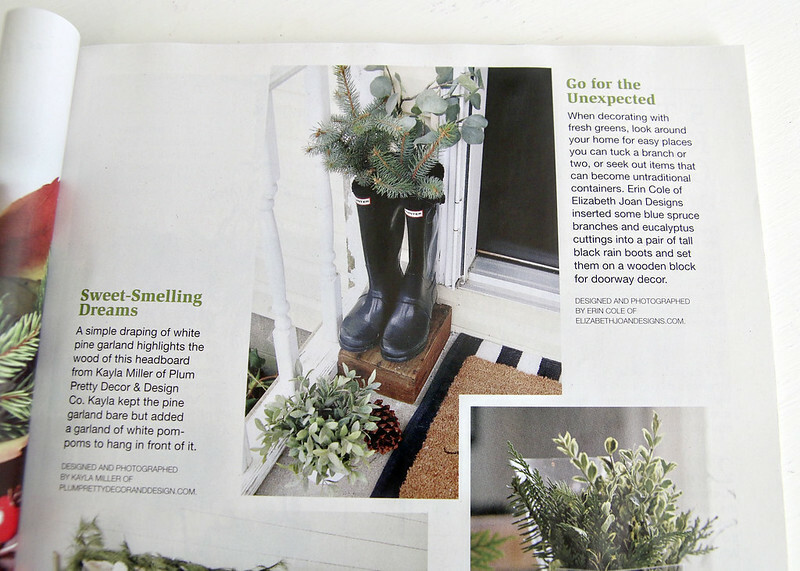 They shared our Holiday Front Porch from last year in their Holiday Homes edition. I cannot begin to tell you how amazing this is a for a little ol’ blogger like me. 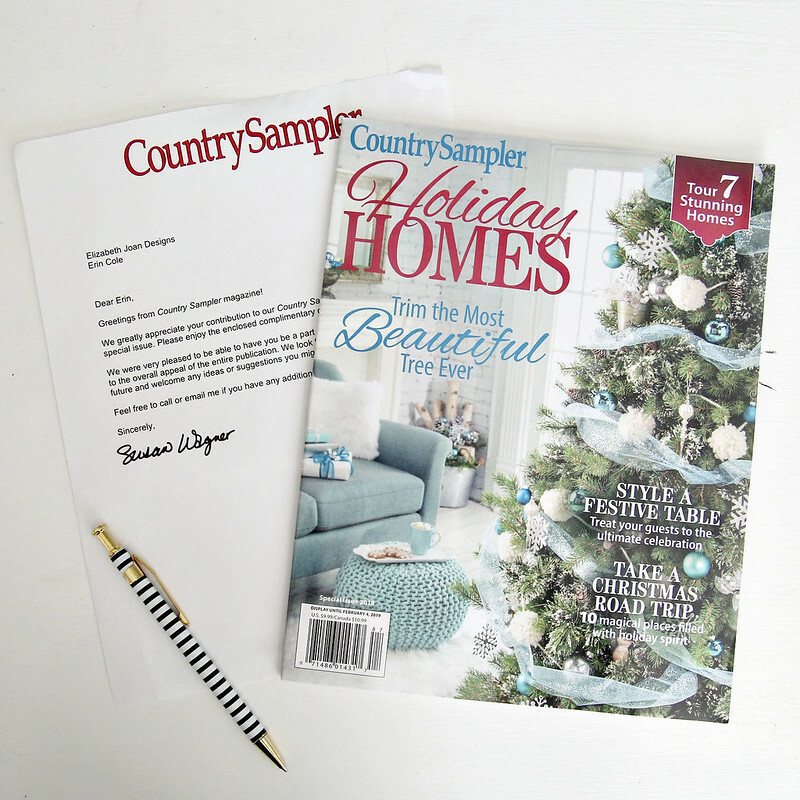 When the sweet people at Country Sampler Magazine first contacted me, my jaw hit the floor. I couldn’t believe that they wanted to share a photo from this blog in their publication. They always share such beautiful spaces and vignettes in their issues. Have you ever checked them out? Some personal information was removed from the letter for privacy. Last year when working on our holiday front porch, I had so much fun putting everything together. This area was a bit of a challenge because I was trying to not to spend a bunch of extra money and had to get creative in my styling. I pulled in some natural blue spruce branches and a few faux eucalyptus pieces to add some extra greenery to the space. The magazine is in stores now, so if you are out and about, stop and grab yourself an issue! 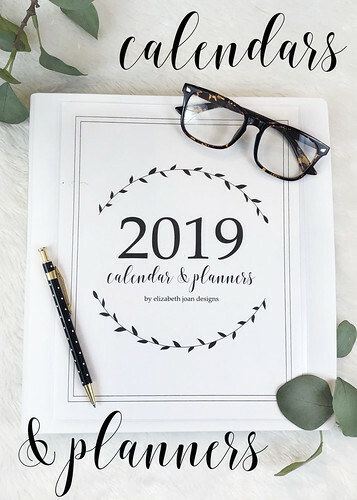 It is such an honor to be included in this issue along with so many other amazing bloggers and designers! 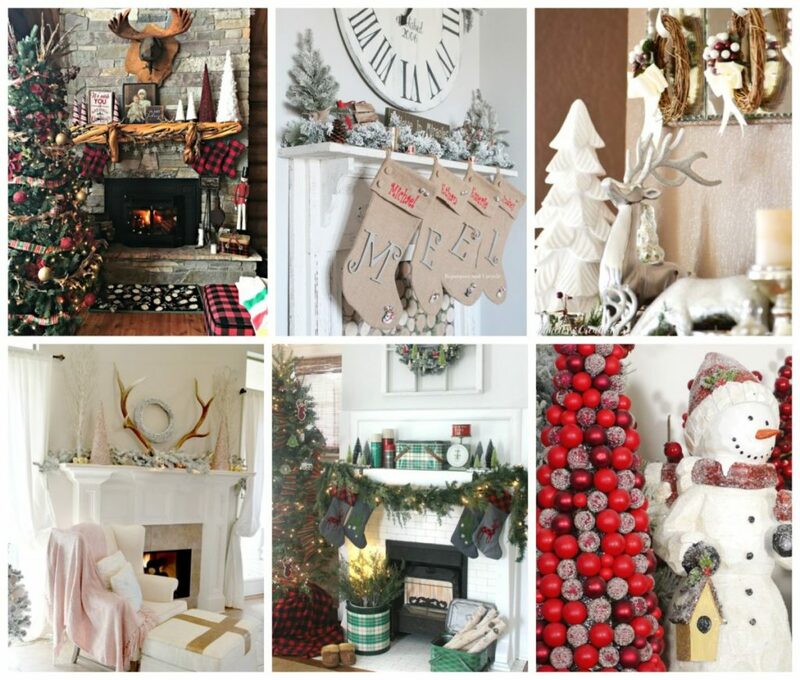 If you want to see more photos of our Holiday Front Porch, click here! 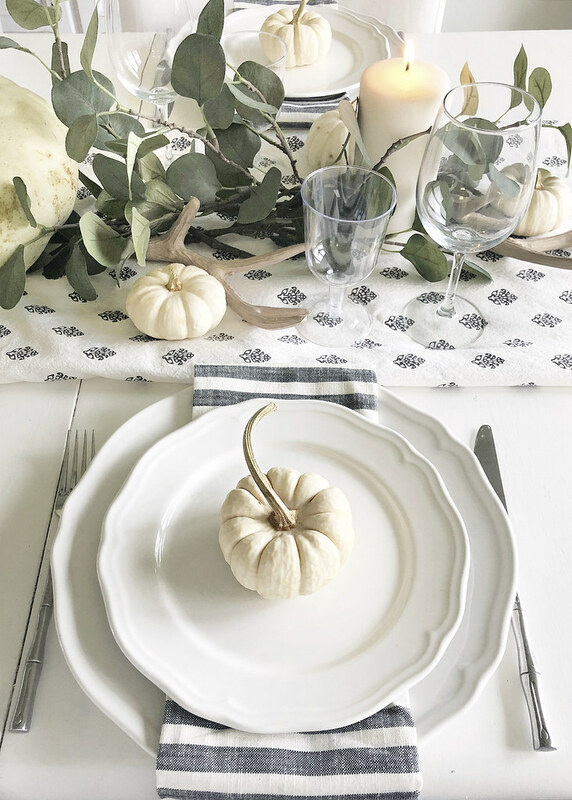 There is no time better than the first week of October to share a fun neutral fall tablescape. I love fall so much! Being able to add autumn elements to our home really just makes everything feel much more festive! 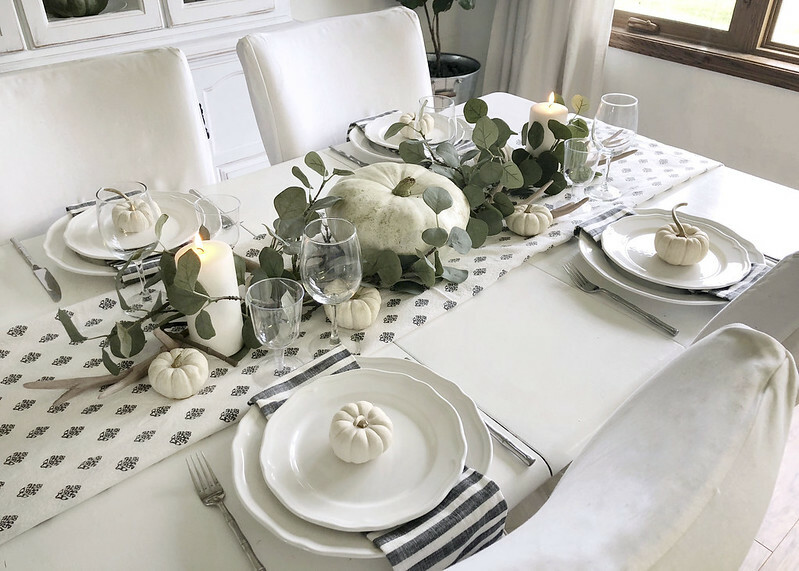 This tablescape is part of the Fall Festival Blog Hop that is happening all week, hosted by my sweet friend, Kendra from Joy In Our Home . 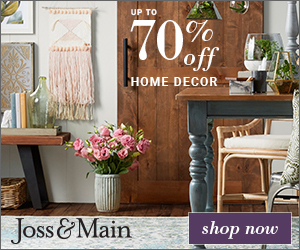 When you are done here, definitely check out some of the other amazing tablescapes, mantels, recipes, vignettes, and front porches! 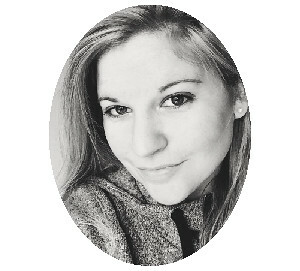 If you are stopping by from My Creative Days, I’m so glad you are here! Disclosure: This post may contain affiliate links, which means we may receive a commission if you click the link and purchase. Clicking a link won’t cost you any extra money and helps keep this site running! Please check out our disclosure policy for more details. When the season rolls around, we can’t wait to pick out pumpkins, go for scenic walks, and jump in the leaf piles. Even though life seems to be speeding up around this time (back to school, activities, holidays, etc.) there is something magical about just taking a step back and appreciating all of the beauty fall produces. 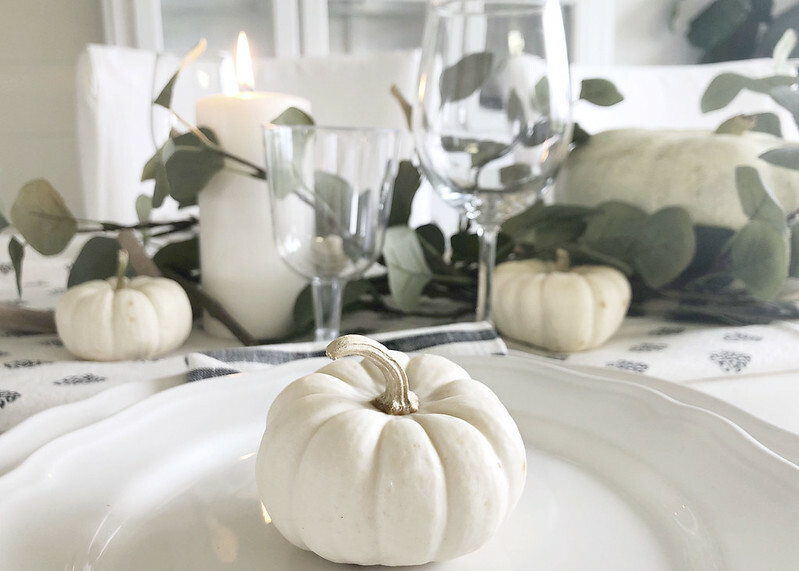 As far as fall decor goes, pumpkins are a must and I chose some pretty white ones to jazz up the table in our updated dining room. I mean, you really can’t go wrong with pumpkins, right? I love it when they have those twisty stems! 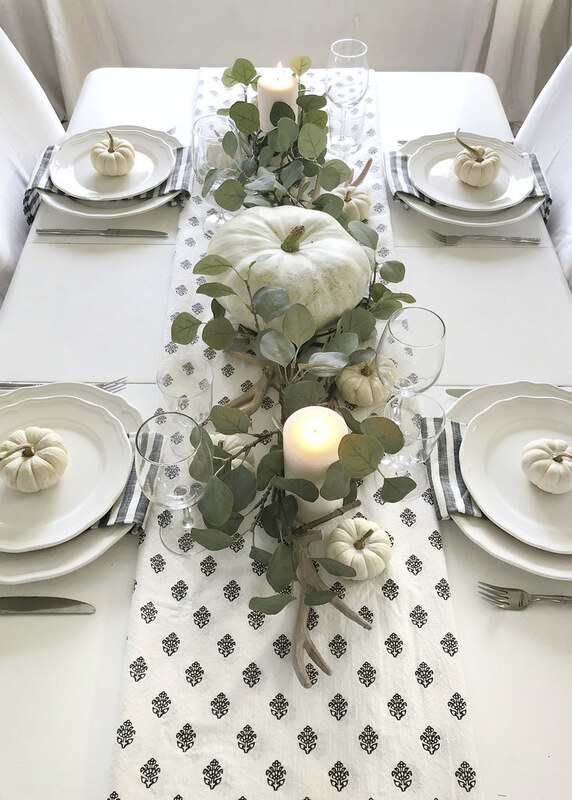 To start this tablescape, I used an folded, fabric shower curtain as a table runner. (It is from Target, but no longer available.) 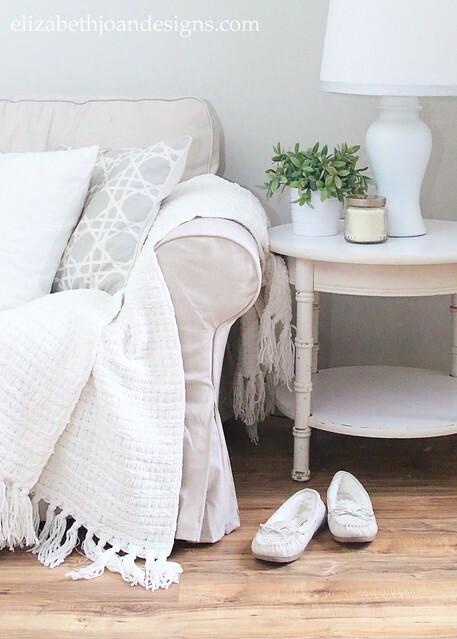 I love the neutral colors and the pattern is delicate and pretty. 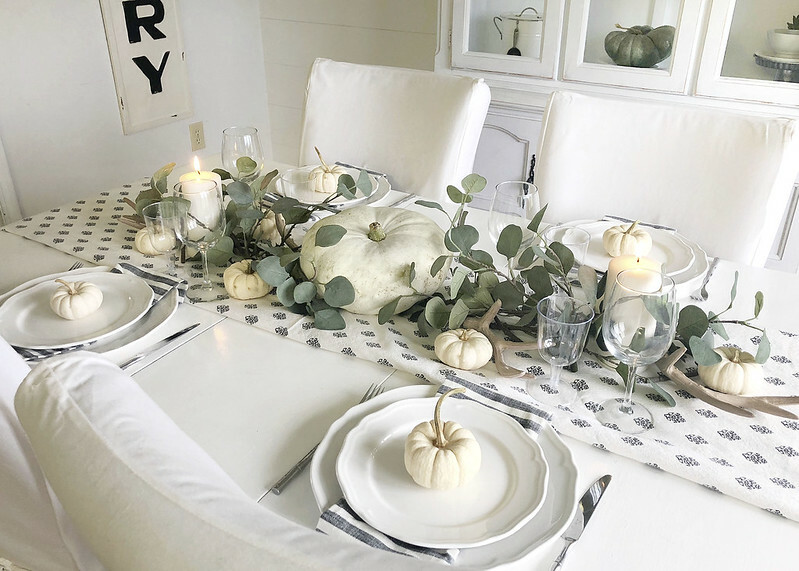 Next, to ground everything, I placed a large green-ish white pumpkin in the center of the table. Then I worked my way out from there trying to keep things symmetrical. To fill things in a bit, I grabbed some faux eucalyptus from a vase in our living room and fluffed it up. I also placed a few small fake antlers here and there and added a couple of plain pillar candles for height/mood. Finally, I set the table with some pretty, wavy dishes, striped napkins, silverware, and stemware. Once everything was together, I just couldn’t stop staring. It was so beautiful! I know that my take on fall decor definitely isn’t traditional. 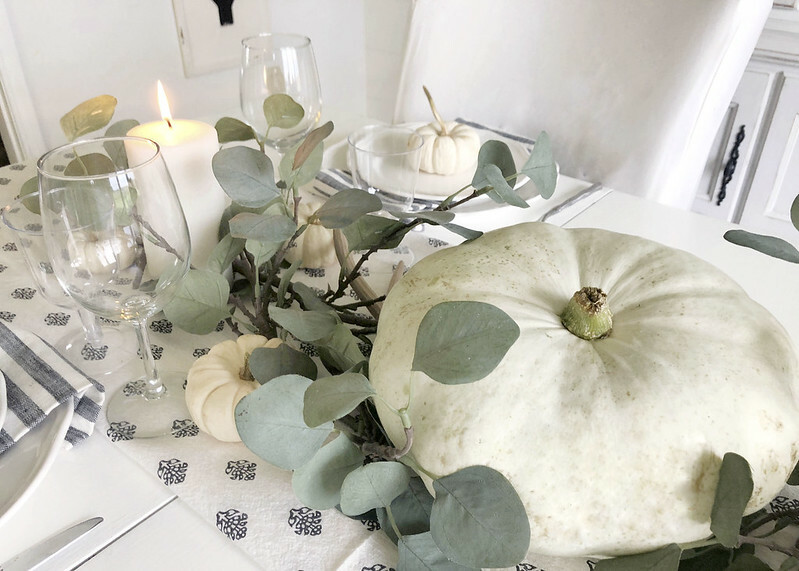 While I still love orange pumpkins, decorating indoors with neutrals that match our home makes everything feel calm and flow together so nicely. 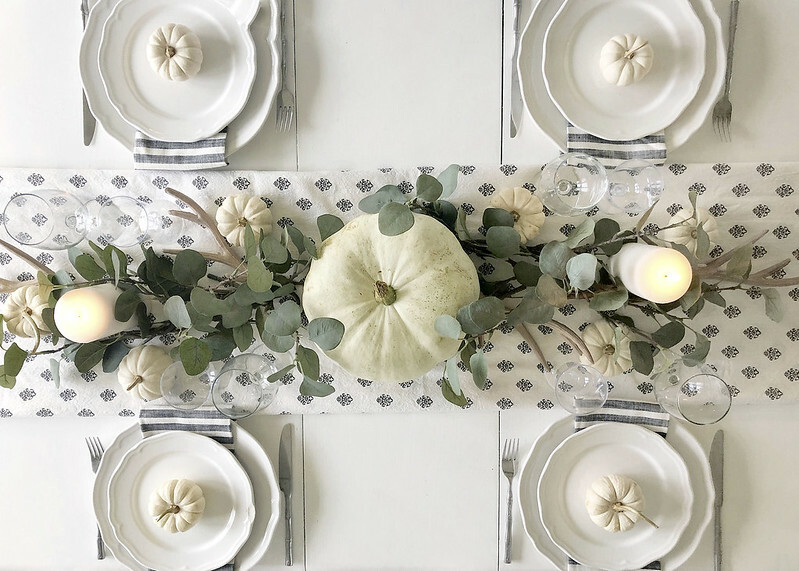 Leave a comment down below and let me know what your favorite way to decorate for fall is! Do you like to go the traditional route or are you a neutral lover like me? 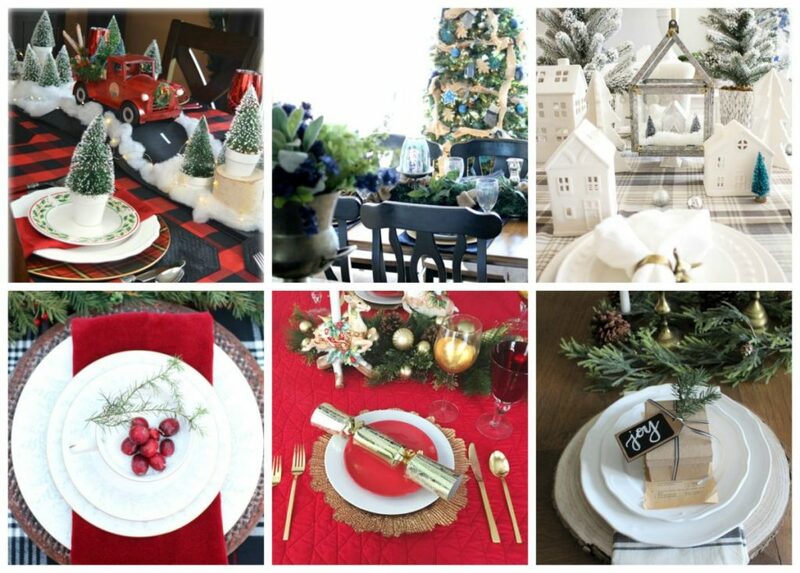 Oh, and don’t forget to check out the next tablescape by The Crowned Goat ! I’m so happy that it is finally fall! The weather around here has started to cool down and I can’t wait for the leaves to change. 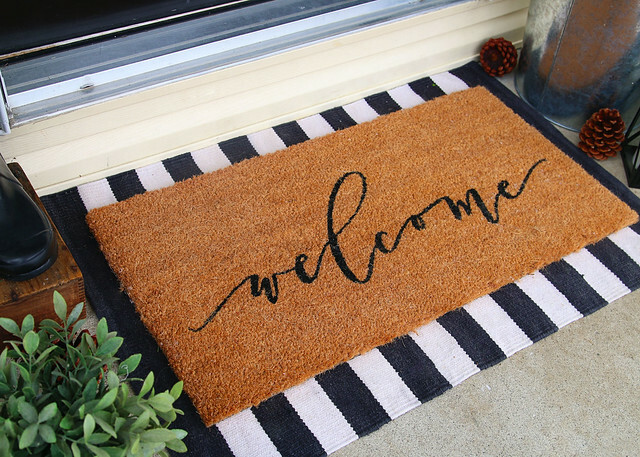 We’ve finally begun to incorporate some fall decor into our home and I wanted to share a fun little project perfect for fall. 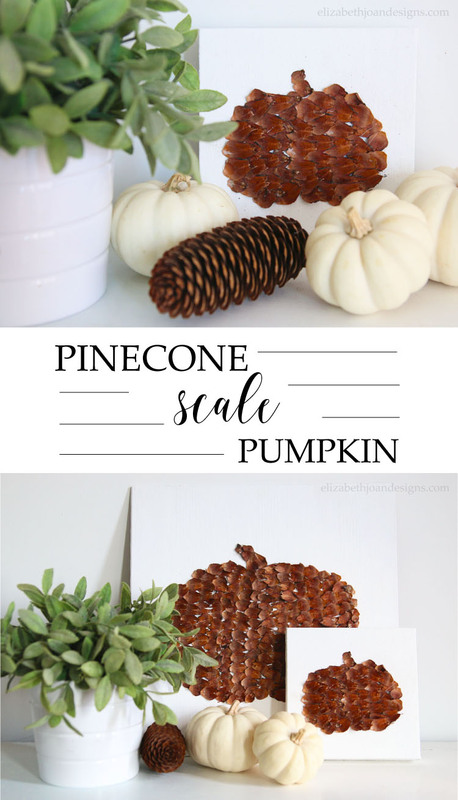 Keep reading to find out how to make a Pinecone Scale Pumpkin. Note about the background: I chose a small 5×5 canvas for this project, but you can use any sort of backdrop for this project. 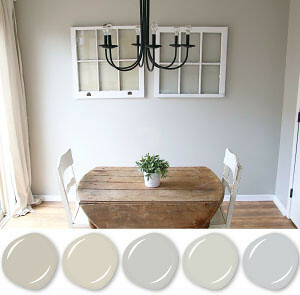 Painted or stained wood, metal, cardboard, etc. Just remember that the size of your background will dictate the amount of time put into the project. 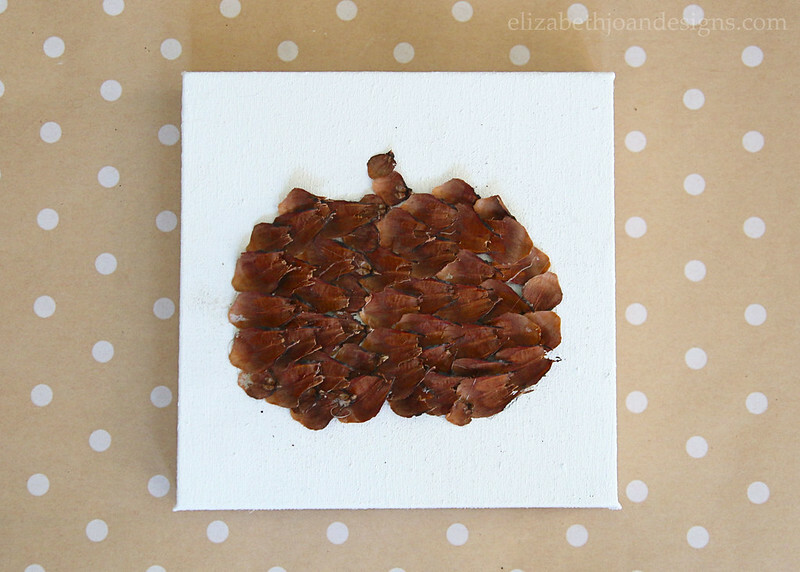 I made a larger pinecone scale pumpkin on a painted wood piece (see it at the end of this post) and it took about 30 minutes to complete. 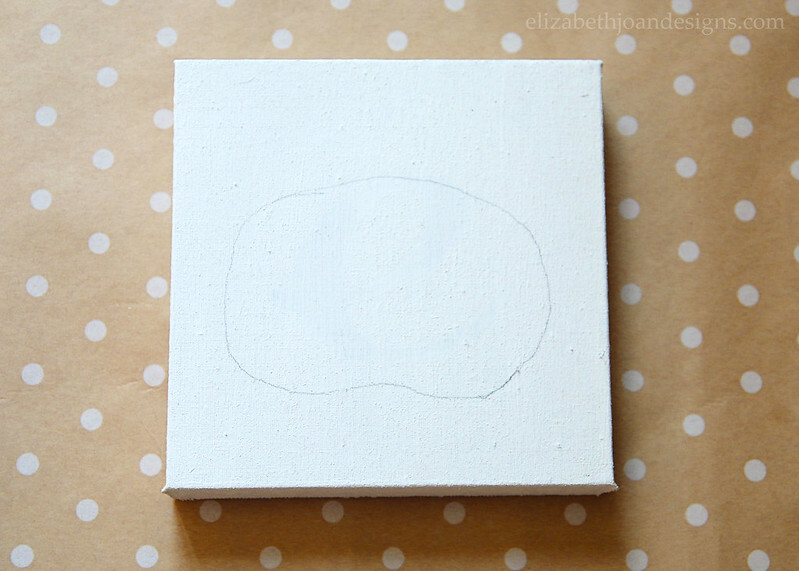 Step 1 – Draw a pumpkin shape onto your canvas. It doesn’t have to be perfect because pumpkins come in all shapes and sizes! 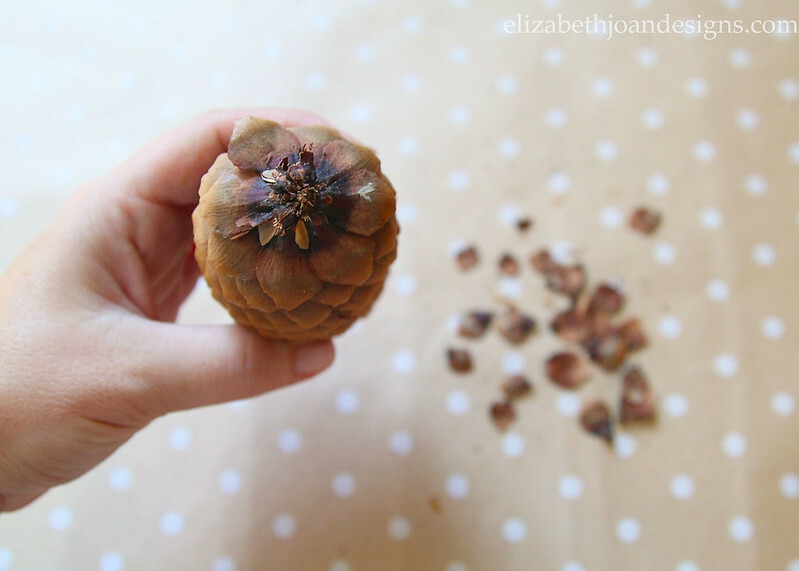 Step 2 – Remove the scales from the pinecone, starting from the bottom. It isn’t too hard to remove them with your own fingers, but if you run into any tough spots, a pair of pliers would probably help loosen them up. 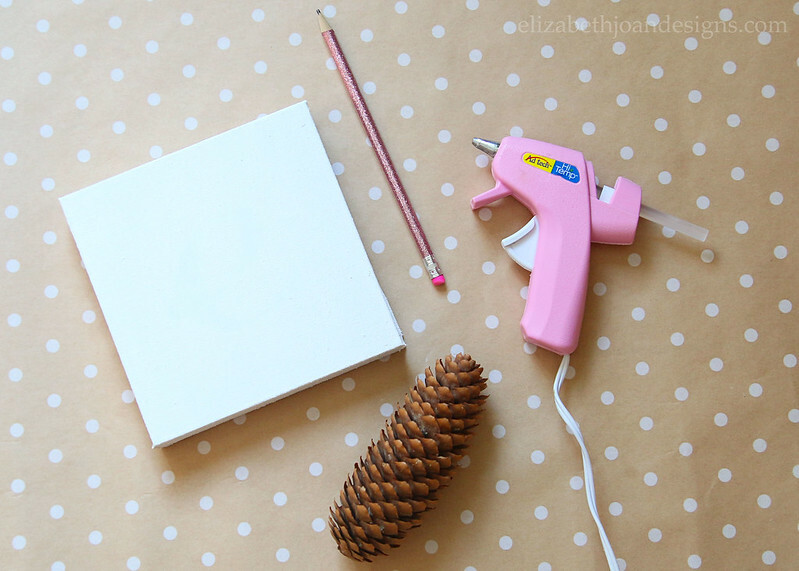 Step 3 – Glue the pinecone scales onto the canvas. There wasn’t really any rhyme or reason to my gluing process. I started by adding a stem to the top and then kind of filled the pumpkin in, adding pieces to cover up any white space inside. Isn’t this little guy so cute?! 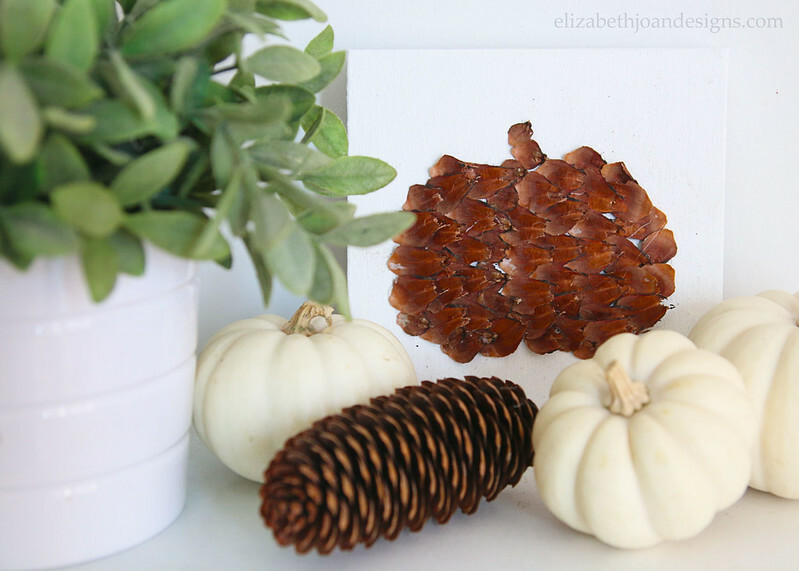 These pinecone scale pumpkins add the perfect amount of texture to almost any vignette. 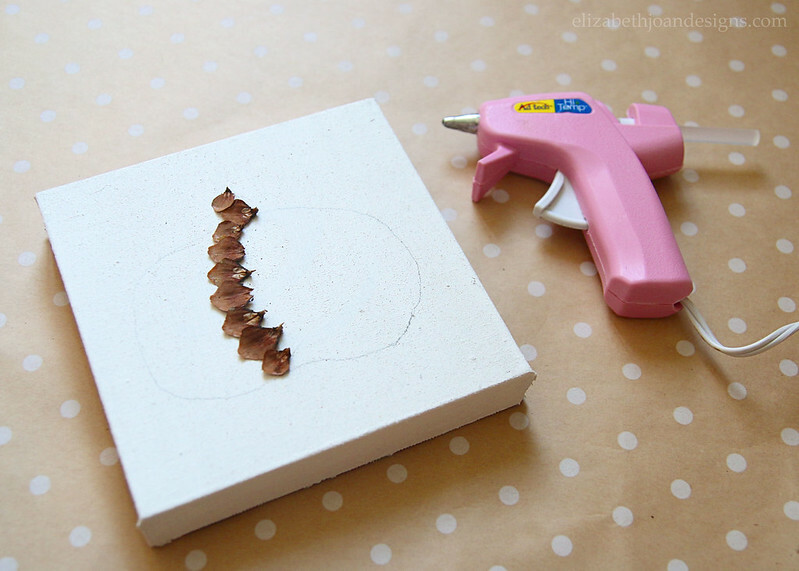 I hope this gives you a little inspiration for your fall decorating and crafting! There are less than two weeks left until Christmas and we are keeping super busy over here! We’ve finally come up with a place in our small home to stick a little nursery, so we have some major moving and rearranging to do. But that update is for another time. 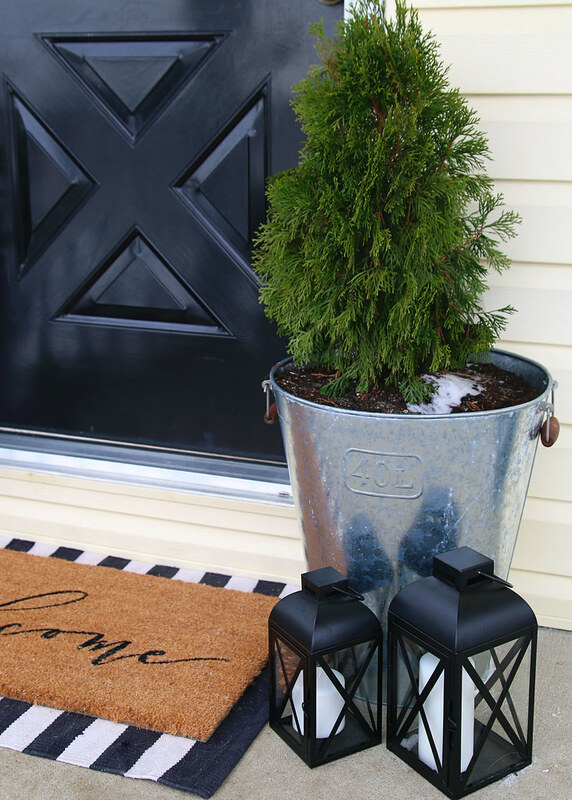 Today it is all about our Fun Neutral Holiday Front Porch! 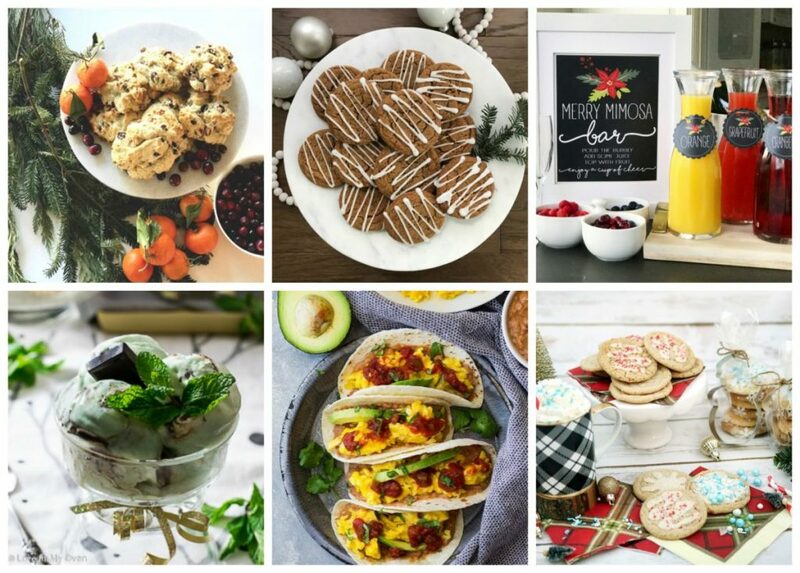 I just love participating in blog hops and am so thankful my sweet friend Kendra from Joy In Our Home invited me to join in for the Christmas Festival Blog Tour! 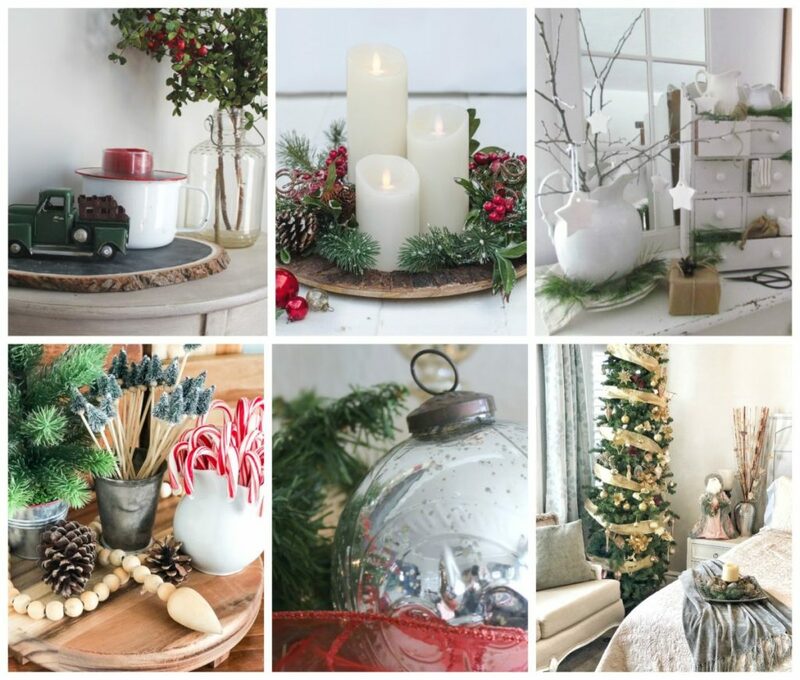 There are so many great holiday ideas shared (mantels, vignettes, recipes, front porches, and tablescapes) and it is is exciting to meet new friends along the way. If you are stopping by from Making It In The Mountains, I’m so glad you are here! 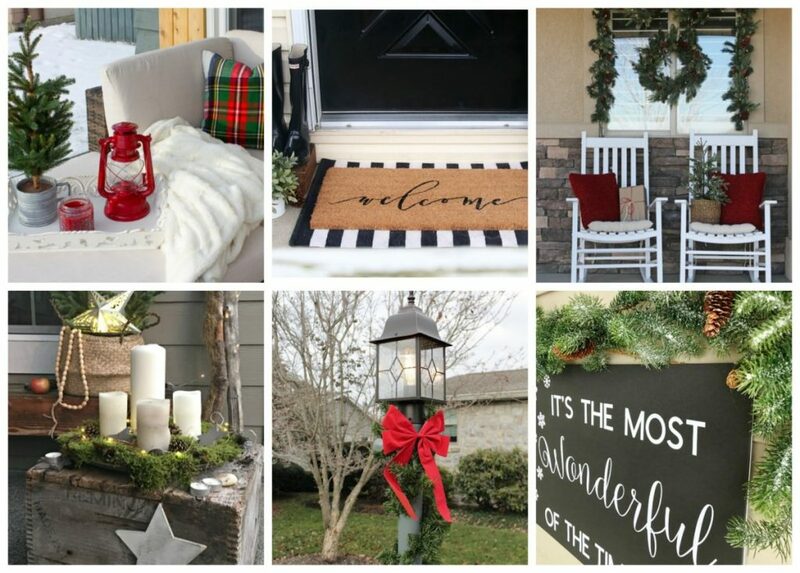 Isn’t Kristi’s front porch just beautiful? Last week, I shared our Christmas living room decor. 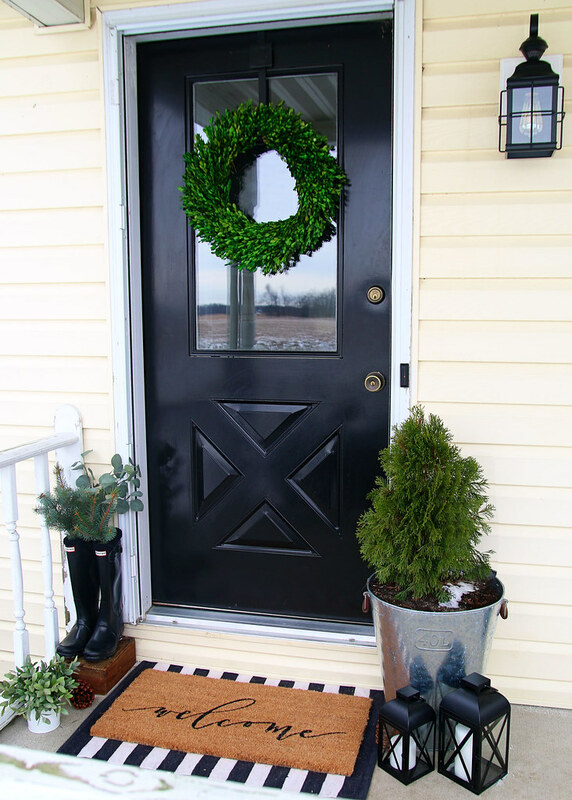 But I wanted to add a little more pizazz to the front porch than just a boxwood wreath, so I made things a bit contrasty out here, while still keeping with my neutral tendancies. 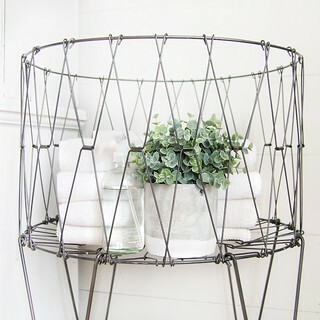 I like to incorporate a lot of greenery, so I gathered different kinds from around the inside and outside of our home. 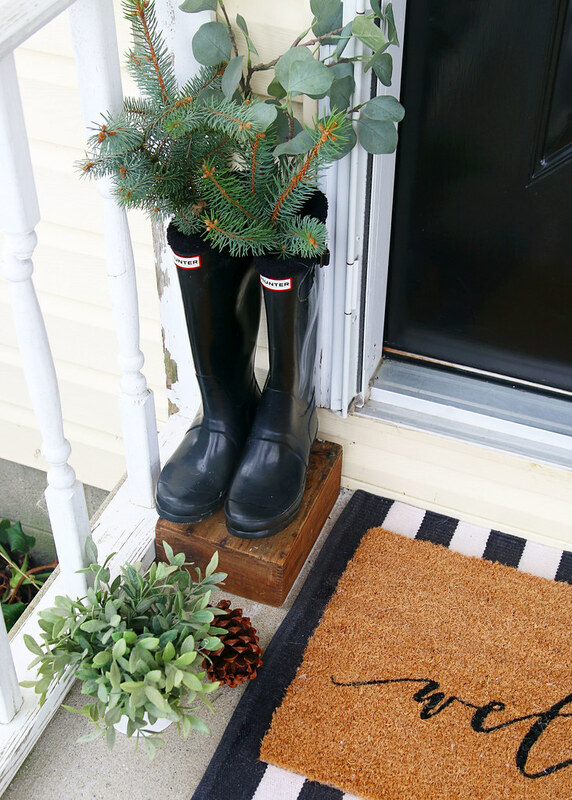 Aren’t these wellies looking festive with some blue spruce branches and eucalyptus? 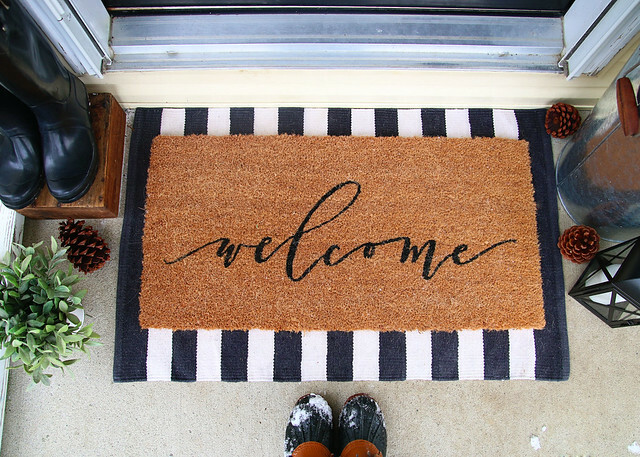 This new “welcome” rug from Magnolia Market (an early Christmas present from my parents) steals the show when layered with this pretty black and white striped number. See that bit of snow on the soil below? Winter weather is here! The cute lanterns were found for a steal at Walmart. (Buy a similar version here.) They look great next to the potted arbor vitae, which was moved to the porch to add some height and life to the scene. And those lanterns go oh so well with our new outdoor lighting! I love this light. 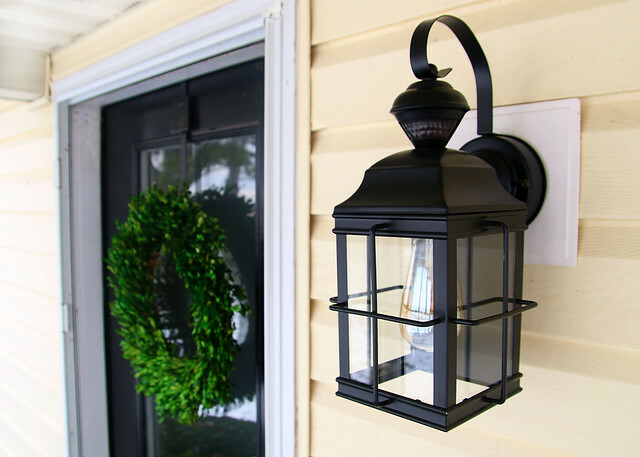 It really helps dress up the front porch and is such a pretty upgrade from the previous one. 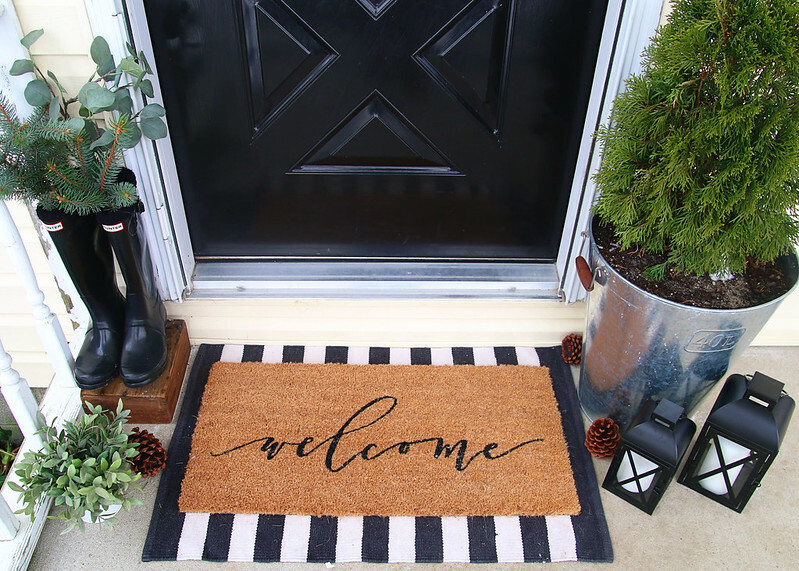 I’m really happy with how our Fun Neutral Holiday Front Porch turned out! What do you think? Thank you for stopping by! Next up is the talented Lindsay from Country Girl Home. 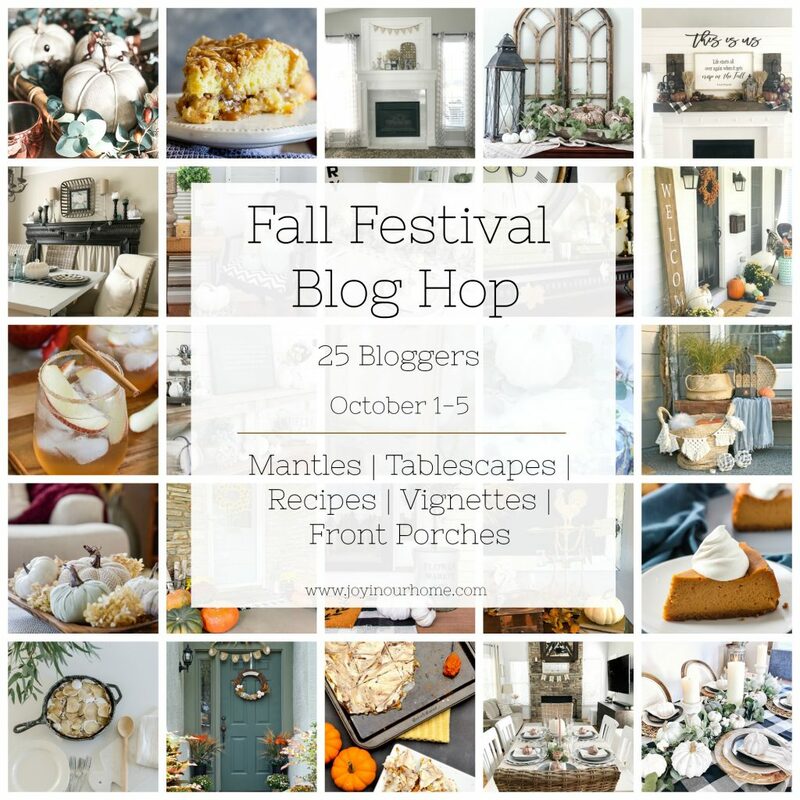 Hop on over and check out her festive front porch!! !